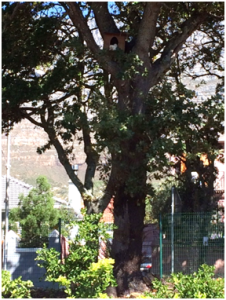 While picnicking in the Company’s Gardens in Cape Town or strolling along the pathway en route to the National Gallery or museum you may have come across the famed white squirrel who lives there. Well either this little guy has relocated or we’ve got another albino squirrel in the city! Recently our team at the farm were lucky enough to spot a snow-white squirrel who had taken up residence in our owl box, high up in the large oak tree bordering Sidmouth Avenue. Albinism in animals is the congenital absence of any pigmentation or coloration, resulting in white hair and pink eyes in mammals. It is also known to greatly reduce their survivability. An albino animal in the wild has a lot stacked against it and they usually don’t survive long as they generally suffer from poor eyesight, hearing disorders, and the inability to effectively camouflage themselves. They are also often outcasts within their family groups and can even be killed for being different. Their survival rate is virtually zero. However, it has been claimed that squirrels are the only known albino mammal to survive successfully in the wild because the retina of their eyes have more rod cells than cone cells (and albinism specifically affects the rods). The central ganglion cell density in other albino mammals is approximately 25% below normal, whereas in squirrels it is only 5% below. This is supported by observations that the behaviour of albinos in the wild, e.g. leaping from branch to branch, is similar to pigmented squirrels. Still, we count ourselves lucky to have this unique creature living with us, and we’re not the only ones. There is a great deal of albino animal lore to be found in the world, especially among American Indian traditions. 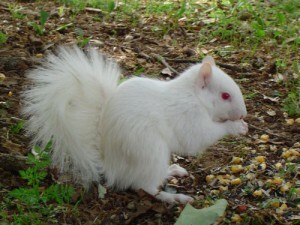 To kill an albino squirrel was taboo and it was believed that you would suffer bad luck if you did. Our little lodger, dubbed Snowy, is an albino Eastern Grey Squirrel (or Tree Squirrel), the kind commonly found bounding about Cape Town’s suburbs. They are in fact indigenous to North America and were introduced to Cape Town around the turn of the 19th-20th century but aren’t considered a serious threat to local biodiversity. When we first spotted Snowy he was hopping in and out of the owl box, exploring the tree and always returning to the box, which has led us to think there might be some babies soon. Sadly, unless our squirrel has mated with another albino, the offspring will inherit the stronger trait -, the typical grey colouring. All the genetic traits for albinism are recessive traits. This means that their influence is hidden when paired with stronger traits. For the recessive albino trait to be expressed in a mammal, the offspring must inherit a recessive gene from both parents. There is plenty of information on albino squirrels online and there is actually an Albino Squirrel Preservation Society based in the United States which is an international collegiate organization dedicated to “fostering compassion and goodwill”. It’s good to know someone’s looking out for these little guys, but in the meantime, here in Oranjezicht, we’ll watch over this one!